Anthony Lane’s essay loves on Bowie best—I love both performers for their wit, emotional expressiveness & poetic panache. To listen to some of the tributes paid over the past couple of days, you might think that Bowie had spent most of his earthly span in a jumpsuit of many colors, or in other varieties of extraterrestrial garb, whereas the sobering fact is that the Ziggy Stardust tour lasted a mere eighteen months. Questioned, early on, about his quicksilver style, Bowie said, “It’s like looking at an actor’s films, and taking clippings from the films, and saying, ‘Here he is.’ ” Notice the stress on the clip. Well before the advent of the music video (another short form that he mastered), and decades before YouTube, Bowie foresaw that our taste, and our impatient appetites, would beckon us toward the fragmentary. He had the courage of his own brevity, being not just canny enough to leave his fans aching for more but wise enough to know that the incandescent glow of a look is all the more enduring, on the public retina, for being snuffed out. Then he paused, relit himself as something else, and carried on. 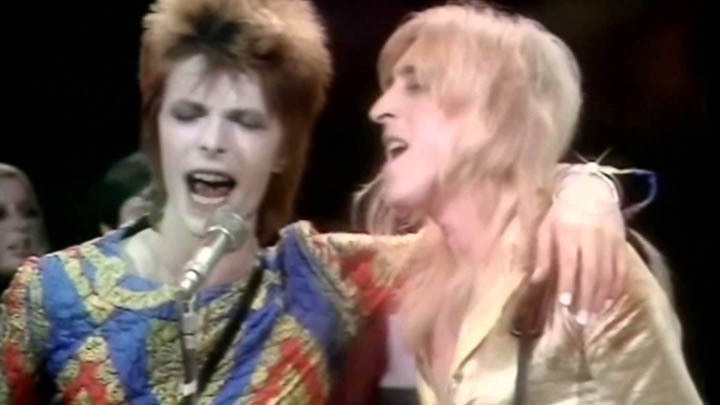 Bowie was frustrated, as Lane implies, by how his comparatively brief Ziggy persona clung to him. Yet Bowie’s adoption of the space waif motif, as astronaut or alien, ran through his career from first to last. A year after Stanley Kubrick’s 1968 film 2001: A Space Odyssey, and just five days before America’s Apollo 11 manned mission to the moon in July 1969, Bowie launched his first hit, the wistful, wittily titled, and perfectly timed “Space Oddity.” This song, which both humanized space exploration and underscored its lonely outreach, came bundled with Bowie’s otherworldly panache and epicene beauty. His steady output proves he was more than these personal qualities, or just someone milking a great metaphor. For evidence see his amusing 2013 music video of “The Stars (Are Out Tonight)”—with Tilda Swinton as his wife—or the ultimate proof, Blackstar, his creative response to a diagnosis of terminal cancer, released on his 69th birthday, just days before his death, and his haunting performance of its title track. We turn to a performer’s youth to remind us what hooked us and to see the dawning of his gift. In 1969, and for some time after, Bowie could shock. His pretty painted face, his glitzy getups. He sure scared me, as the southern and surf-town boy I was, despite my feeling the tug of melancholy narratives like “Space Oddity” or the joy of Picasso-esque mashups like “Suffragette City.” There was a divide I wasn’t fully aware of between British rockers’ theatricality and their American counterparts clad in jeans. Indeed Bowie and his friend Iggy Pop thought of themselves as directly taking on this blue-collar or tie-dyed hippie aesthetic. It’s all performance, Bowie said. Yet as an American I’m hardwired to respond to denim semiotics. As Bowie once said, Bruce Springsteen must wear that costume to sing his American anthems. British performers’ admission of artifice and their frank love of glamor was, and remains, a corrective to Yank naivete and piety. 2013 was not a bad year for the cinema, what with films such as “12 Years a Slave,” “The Great Beauty,” and “Blue is the Warmest Color,” but none of them, I think, had the sudden impact that was made by Bowie’s “Where Are We Now?”—the song that fell to earth, unheralded and unhyped, on January 8th. “Just walking the dead,” he sang, without fanfare or ado, like a man out walking his dog. Stories were told of grown men switching on their radios, hearing that new cry from a familiar voice, and being stirred to the brink of tears. . . .
Nobody, nowadays, recalls much of “Absolute Beginners” (1986), and rightly so, but the whole enterprise was worth it for the title song that Bowie provided—for the single chord, to be honest, that strikes between the first and second lines of the verse: “I’ve nothing much to offer / There’s nothing much to take.” But why are we struck so? What is it in the echo of that strum that refuses to go away? In a word, surprise. Time and again, whether in the symphonic flourishes of his dress-sense or in the choice of one note, Bowie perceived our expectations and swerved aside. He grew weary, it is alleged, of the “Serious Moonlight” tour, in 1983, and perplexed by the pitch of fame that it brought, but I cannot forget the Shakespearean shock of hearing that adjective for the first time, on “Let’s Dance.” Moonlight had always been gentle, or flattering, or soft; it was the stuff of sonatas and serenades. But who knew that it could be serious, like an ailment or an affair of state? As Lane’s eloquent take on Bowie builds, he addresses my intractable qualms about movies being a lesser form of art beside literature: “Movies are the bedmates of poetry, as Bowie knew, and to treat them as a sort of illustrated novel is to load them with a burden they were scarcely designed to bear.” Noted, sir. Since I respond to Bowie’s elliptical touch, his riveting quickness, his warm presence amidst a polished demeanor, all the better if he brought that flash to Zoolander. [W]e realize that Anderson is doing what millions of others have done before: he is handing over his feelings to David Bowie, and letting a song do all the work of the heart. Why write dialogue when the wild exclamations of another artist, recorded in 1971, will give vent to everything that you want your characters to say—or, rather, what they cannot say because it is all too much? Such is the yearning that beats throughout this scene. You can see it ten times or more. It is never a saddening bore. But isn’t that what we do, entrust our feelings to artists, who paint them across the sky? It’s hard to imagine Bowie not being an artist, though he once said the happier existence seemed to him an ordinary workaday life with evenings spent in the warm bosom of a provided-for family. To spur his writing, Bowie was known to exile himself to places he hated, such as Los Angeles, or that made him feel the utter alien, like Japan. He set his own path early, and trained for the job of emotional expression. In youth he studied painting, music, graphic design, dance, and mime. And then “Space Oddity” arose, when Bowie was about 23, out of a long apprenticeship in bands. For all his admitted personal excesses, he was hard-working man. Bowie defined himself as disciplined because he completed his ideas, however tedious the process of realizing them might become for him. And clearly he enjoyed himself with others under the spotlight, whether in performance (see his exuberant dancing with Mick Jagger to “Dancing in the Street”) or on countless TV talk shows. I’ve always been a fan above all of Bob Dylan, such a Shakespeare of our time, yet feel rueful watching Dylan’s unwelcoming introverted-unto-isolated demeanor. What a grace that Bowie could regard us with delight. Art is made of emotion and it’s about emotion. Lane’s essay showcases perhaps the highest role of the critic, to be emotionally responsive in turn. Which challenges his audience to do likewise. Of course the critic must appreciate without becoming slavish, must show how the artist is pushing our buttons—and teach us that appreciation too. In his New Yorker essay, Lane, like Bowie, is working out a delicate calculus between heart and head. He explains what we had in Bowie, someone who made art with such care and offered it so freely. But though gone himself, Bowie’s work isn’t lost. Not anymore, not in the techno-jangled world that provoked his lifelong and defiantly celebratory reply. I’m eager to see The Life Aquatic again and experience with Lane’s help the scenes with Bowie’s music. 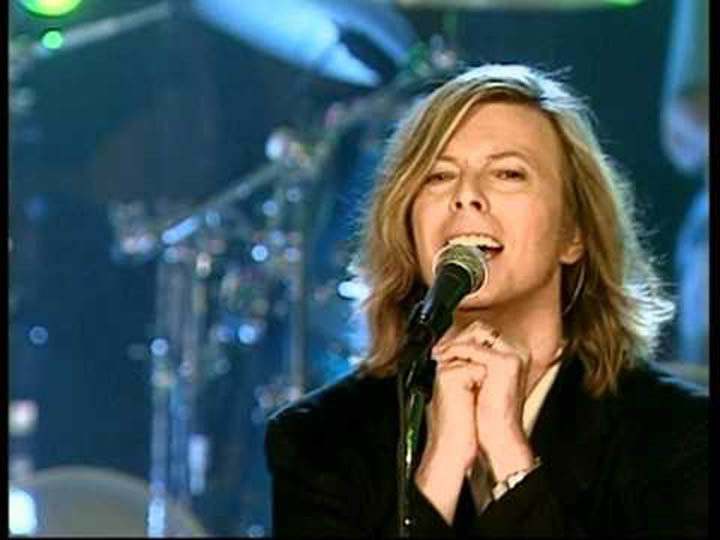 Meantime, Bowie’s hits are on autoplay on my soundtrack. Indeed rock ‘n roll never forgets: works of art are messages sealed in bottles. But the notion arises that if you miss the art of your time, in its time, you just might miss your time. Maybe it takes a professional appreciator like Anthony Lane, so often the funny-but-frosty Cambridge man, to sound that warning. I take Lane’s implication from what’s there and what’s not. The bones are plain to see. He turned emotion into an essay, and used that shapely vessel to pour forth his love. Do you remember a guy that’s been / In such an early song / I’ve heard a rumour from Ground Control / Oh no, don’t say it’s true . . . I knew so little of David Bowie before his death. Hate to admit that. Part of my tangential relationship to pop culture. However, watching and listening to the “Lazarus” video, I realize I missed an artist, not a pop rock star. Thank you for this great tribute. Charming in every way. “I realize I missed an artist, not a pop rock star.”—Perfectly said, Shirley. And what so many of us now feel. I took him for granted. Listening to his music again, I realized how much of it is entwined with my life. I guess here’s my partial penance. But Blackstar is NEW, and all can listen. I’m listening and gobsmacked. Dear Richard, Yes, it’s sad that we lost Bowie so comparatively young, but as my brother reminded me, we also recently lost the fine actor Alan Rickman, also at age 69, recently too. Somehow, I never thought of them as being close in age. Yes, Victoria. It’s hard to believe Rickman is gone too. Such a fine actor!